Liam Neeson and Pierce Brosnan slog it out as enemy veterans of the American Civil War. While the rest of the USA find peace, redemption is a little harder for those with a grudge. Acting under orders has always been the trickiest of defenses after the atrocities of war. Human emotions cannot just be switched off, because men in power declared the fighting to be over. Gideon has to survive (with a seemingly infinite supply of resourcefulness) in terrain ranging from a frozen mountain trail through to the parched and exposed desert. Carver is a man for whom revenge is all. He will apparently stop at nothing to see Gideon dead; and he leads a posse determined to do just that. It's a stalk and kill Western action adventure, with an twist. The few high points didn't render this a great film, nor did its plodding lack of subtly make it a poor film. It was just average. I was enticed into this movie by the fact that Liam Neeson is in it. I don't recall ever seeing him in a bad film. Unfortunately, this one came close. 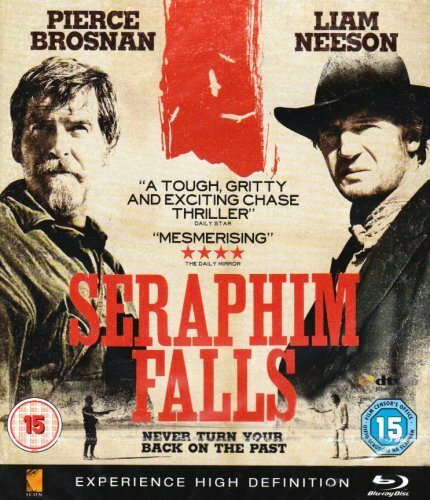 I don't regret spending the past hour and forty minutes of my life watching Seraphim Falls. The cinematography alone made that worth it. Though set in the Great Basin of America, starting in the Ruby Mountains and moving into the Nevada Desert, most of the filming took place in New Mexico. Not that it mattered much. It was all beautiful and all good for a stunning backdrop to the action. Plus the plot was fascinating, even if it stretched credibility at times. Gideon is the ultimate survivalist and there was a certain amount of realism with how he tended his wounds. I kept on watching because I wanted to see how he extracted himself from increasingly terrible situations. Finally, there was a scene near to the end which amused my Pagan sensibilities. Angelica Huston was like Morrighan on the battlefield, bringing all of the fighting to a close. Peace up to Heaven, Heaven down to Earth and all that. 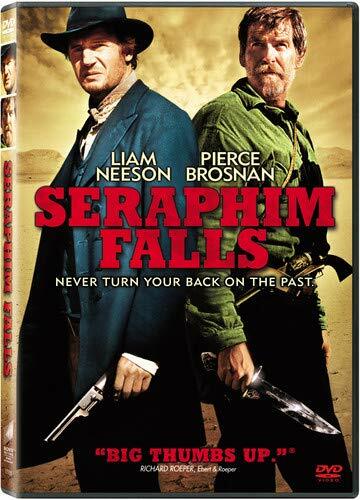 But despite these redeeming features, I never felt that Seraphim Falls attained anything greater than merely average. It was difficult to work out what an actor of Liam Neeson's caliber was doing in a movie like this. 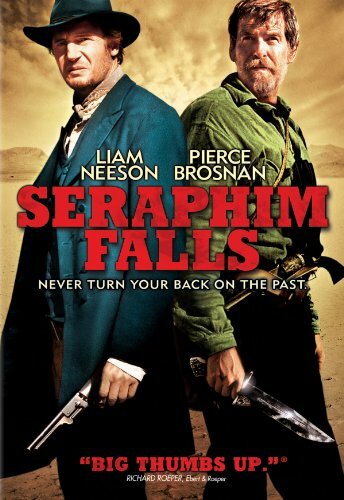 I don't want to give the impression that Seraphim Falls was a terrible film. It wasn't. I never once reached the point where I wanted it to hurry up and end. But it never quite lived up to the underlying themes; and they were about as subtle as a flying brick. It was all about surviving against the odds; avenging the loss of loved ones; and true men are anti-war. If there ever were moments when deeper notions, like how terrible acts of war can squash the humanity in a person, then it was only when Liam Neeson's acting forced them to the fore. This is a very Pagan interpretation of a climactic scene. It probably isn't what the director intended! However, there were scenes in the desert, pushing the action towards its ultimate high noon, which caught my attention. Other critics have dismissed it all as finally descending into silliness or, at best, surreal bizarreness. But my Pagan eyes found something wonderfully Morrighan-like in the sudden appearance of Louise. There was undoubtedly an air of the uncanny about her. While I was interpreting her as the Goddess of War, others have used her presence to call this a Western set in a more Christian limbo. Are we absolutely certain that both veteran soldiers are still alive? They're not just sorting out their differences before one or either can pass into Heaven? And is Louise not the Devil in disguise, come to take the last vestiges of their lives, before rushing them into a conclusion? Until now, it was difficult to see how this movie was going to end, without one of them just killing the other. Given the cat and mouse nature of the storyline thus far, that may have appeared anticlimactic. Instead, you get Angelica Huston's character resplendent in red and black, setting up a tableau which had to bring it all to a dramatic close. I enjoyed that part. It redeemed the rest and elevated the movie into a slightly higher category. It finally made me question if there was more here than meets the eye, after all there was also the strange appearance of the old man at the watering hole. Then the missionaries before that. Straight down the line Western adventure? Or the ghosts of the Civil War playing out their trauma in a barren landscape? You decide! Based on the book 'The Killer Angels' by Michael Shaara, 'Gettysburg' was filmed on location at the actual battleground. It is the longest ever American film. Tony and Ridley Scott are the directors of this gritty docu-drama, which focuses on lesser known stories from the Battle of Gettysburg. Originally shown on The History Channel. The Bechdel Test asks that there are two or more named female characters, who have a conversation about something other than a male character. Given all that I've said so far, I'm guessing that no-one will be surprised that Seraphim Falls doesn't pass the Bechdel Test. There are three named female characters - young Charlotte, who encounters Gideon early on; Carver's wife Rose; and, most notably of all, the traveling saleswoman Louise, purveyor of Cure All Remedies. Seen from a certain point of view, the plot is all about women, or how men react in connection with women. It's Rose who sets the whole chain of events in action. It's Charlotte who facilitates Gideon's initial escape. It's Louise who calls it to its end. However, they are never even in the same bit of landscape, let alone in the same scenes. They do not have a conversation about anything at all. Yes, that final scene, set up by Louise, did elevate the rest of the movie for me too. Liam Neeson is always amazing. I've always liked Pierce Brosnan's boyish charms. He was not boyish at all in this movie. With respect to Liam Neeson he always earns my respect. Very seldom does his performance disappoint and if it does it's because the script sucked. Not him! I saw this movie and at the end I totally got the point! It's worth watching. It's not the greatest movie that I've seen all year, though that scene with Louise was intriguing. Yes, I did. Thanks for reading that too! I do understand that the Civil War was predominantly male, at least on the battlefield, but yes, it failed. another civil war flick fails the bechdel test eh? didn't you write an article recently proving there WERE actually woman in America at the time?